Want to step up your beauty routine this year? Our list of beauty new years resolutions will have you looking gorgeous from January on. This year, rather than just setting plain old New Year’s resolutions, I wanted to create beauty resolutions instead. From taking better care of my skin to keeping my hair looking good, I’m making some positive changes to my beauty routine for 2010. Wanna have a more gorgeous year as well? Here are five beauty resolutions that I think everyone can shoot towards. 1. Always wash off your makeup before going to bed. Sometimes after a long night of studying or partying, it’s easy to get lazy and just fall asleep without washing your makeup off. Yet a couple days later, a newly formed pimple will haunt you as a result. I am horrible at washing my makeup off sometimes and I always regret it the very next morning. In college it is so tempting to just crash on your bed, but a day’s worth of unwashed makeup can easily clog up your pores and cause other skin problems, too. So make sure to remove all your makeup before going to bed; your skin will thank you. It is so important that you wear sunscreen to protect yourself from harmful UV rays, especially if you live in a sunny area like Southern California as I do. Studies have shown that daily use of sunscreen is the best way to fight pre-maturing wrinkles. The best way to add sunscreen to your daily skincare routine is to use a moisturizer that contains an SPF of at least 15. My personal favorite is Aveeno’s Daily Moisturizer with SPF 30 . It does wonders as a face moisturizer and takes care of my SPF needs at the same time! 3. Avoid overusing heat styling tools (i.e. flat irons and blow dryers). I know many girls who use their hair straightener like it is their daily vitamin supplement. But using your heat styling tools on a daily basis can do some serious damage to your hair resulting in dry, split ends and frizz. Ideally, you should air dry your hair whenever possible and try not to use your flat iron every day. 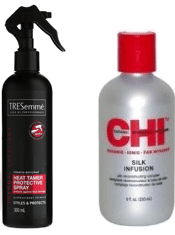 If you are one of those girls who simply cannot part with your flat iron, consider using a heat protective product like TRESemmé’s Heat Tamer Protective Spray or CHI’s Silk Infusion. Using heat protective products can greatly decrease the amount of heat damage to your hair. So if you want shiny, healthy looking hair but still want to use your styling tools, make sure to protect your hair! 4. Don’t be afraid to try something new and funky. I always reach for my neutral shadows for any look, whether I’m going to class or going out with my friends. However, this year I plan to step out of my safety zone and experiment more often. One thing that I love about college is that it’s the best time to try new things before you have to join “the real world”. Really, college is the only time you’ll be able to justify wearing neon colored American Apparel bras and not be considered weird. So my main beauty resolution is to try something new and funky more often. Maybe I’ll line my eyes with vibrant purple eyeshadow the next time I go out to Frat Row with my friends. Or maybe I’ll try the statement lipcolor trend. Who knows, maybe I’ll find my next go-to party look! 5. Avoid falling for overhyped products. I think we have all fallen victim to this at one point or another: a new “must-have” product comes around and you rush to purchase it only to find that it’s complete crap. 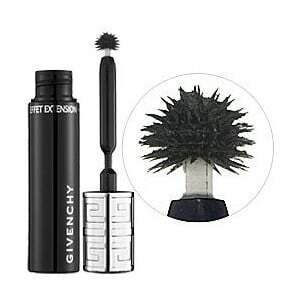 For example, when the luxury brand Givenchy produced their Phenomen Mascara, people went crazy for the spiky ball shaped wand (supposedly the “latest mascara technology”). Beauty editors raved that the mascara enabled them to coat every lash with precision. Because of this, hundreds of convinced women flocked to buy the mascara only to find that it gave them clumpy, messy eyelashes instead of defined ones. That’s why for 2010, I am making sure to always check the reviews on MakeupAlley before I decide to buy a product. Honest reviews from women just like me are always the best way to avoid these overhyped beauty products. I shared my top five beauty resolutions, and now I would love to know what your beauty resolutions are! How are you going to make 2010 your most gorgeous year yet? Let me know your thoughts in the comments.